Despite the positive Euro industrial production report, EUR is still weakening. EURUSD has been under the influence of German government bonds yields and the UK referendum as well. EURUSD has already passed the 61.8 of Fibonacci retracement and is creating the reversal pattern. 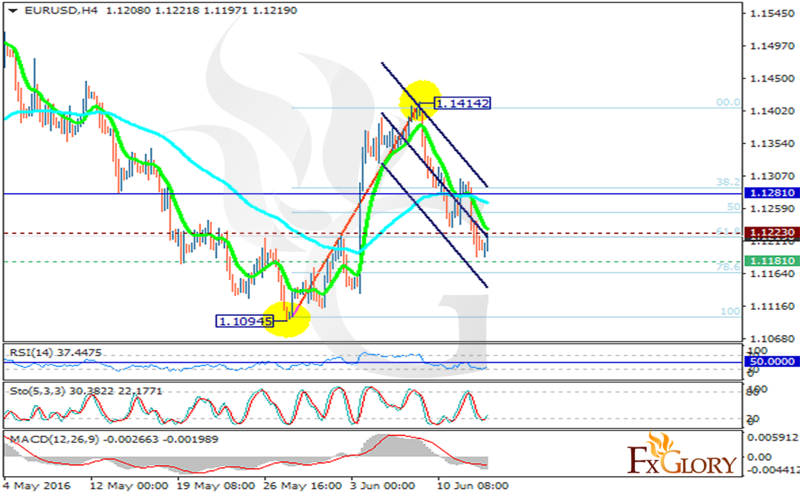 The support lies at 1.11810 with resistance at 1.12230 which both lines are below the monthly pivot point at 1.12810. The EMA of 10 and 75 are moving close each other however the EMA of 10 is moving downwards. The MACD indicator is in negative territory, the RSI has passed the oversold zone and is moving towards the neutral zone and the Stochastic is showing upward momentum. The resistance level breakout will push the price towards higher ranges targeting 1.1370.